Winemaking: Grapes are harvested early from a selection of estate vineyards including Serralunga d’Alba, Diano d’Alba, Treiso and Trezzo Tinella. A short maceration is followed by fermentation in stainless steel tanks, then aging in stainless steel tanks “deep in our ancient cool cellars until the bottling in the month of March after the harvest”. The name ‘Il Nebbio’ derives from “Nebbiolo”, as the wine is an expression of “the fragrant, youth and fresh version of such a great and noble grape variety”. Tasting Notes: Transparent garnet in colour with generous aromas of strawberry, cherry, dusty earth, spice and a trace of sweet hay and wildflowers. Red currant, cherry, crushed black peppercorn along with an herbaceous trace are framed by woolly tannins*. Earth and spice notes persist on the lengthy finish. A great play between fruit, spice and tannins, it’s an incredible and unique experience to enjoy Nebbiolo so young. 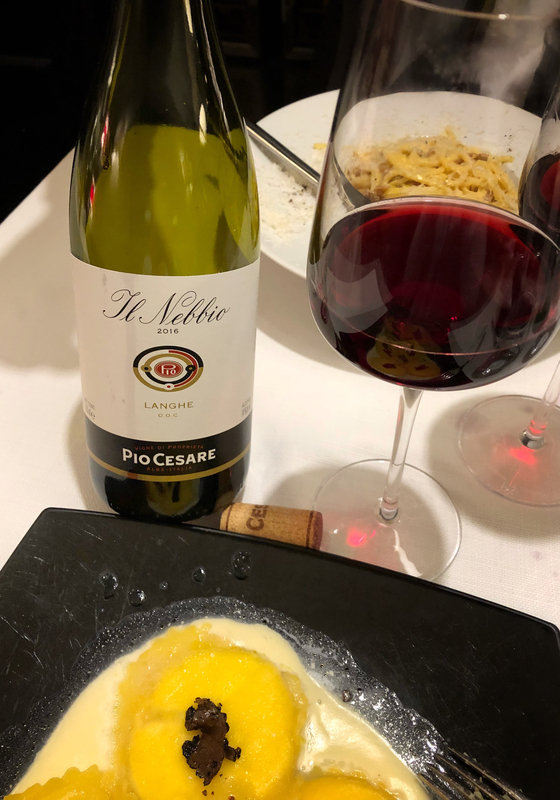 I recommend pairing with food; it was spectacular with fresh burrata cheese ravioli with parmesan cream and black truffle, along with spaghetti “alla carbonara” with guanciale from Amatrice, “vacche rosse” parmigiano cheese and Sichuan pepper. *So fuzzy my teeth stuck to my lip. Currently not available in the US, average price in Italy is €16. I paid €27 in a restaurant in Rome.